And it is with a great sense of history and gratitude to all Biafrans that we observed this year's event with resounding success across Biafraland and all over the world. 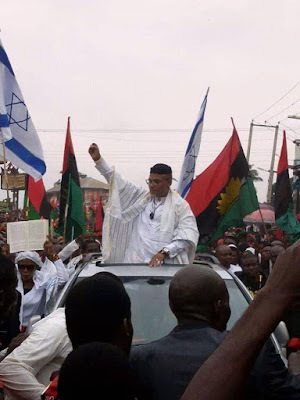 That it succeeded despite all odds and machinations of the enemy, will make it go down in annals of history as confirmation that IPOB under the leadership of Mazi Nnamdi Kanu is exceptionally indefatigable and the dominant force across the entire East not just Igboland. It is also confirmation that the vast majorities of our people are with IPOB and remain committed to our collective pursuit of self determination for all. It is pertinent to note that great nationalist struggles throughout human history suffered one setback or the other. So, just as in our own case, we are very much aware of all the attempts from within and without to break the will of our people. There were threats, blackmail, military reinforcements, threatened arrests, and a media blitz by the happy slaves among us to scuttle this year's 'Sit At Home'. But like Dim Odumegwu Ojukwu once said 'Biafra is of the mind', so no one can kill or suppress it. How could anyone ever believe that it is possible to prevent us from remembering and honoring our dead, our maimed, our persecuted? We appreciate the fact that some governors such as Ifeanyi Ugwuanyi, Rochas Okorocha, Nyesom Wike, Ifeanyi Okowa, Siriake Dickson, Udom Emmanuel and Ben Ayade did not belittle their office by coming out to act as attack dogs for Arewa Consultative Forum (ACF) as Umahi and Obiano did. Buhari' should take lessons from apartheid-era South Africa which also proscribed and declared the African National Congress of Nelson Mandela a terrorist organization. He should also remember Jomo Kenyatta's MAU MAU which the colonial authorities proscribed and declared a terrorist organization. In both countries, freedom and self determination triumphed in the end when both Mandela and Kenyatta emerged from prison and tribulations to lead their countries and people. God bless you. God bless the faithfuls. God bless the dead, the maimed, and those among us who've lost loved ones. May God provide fathers and mothers to those who lost theirs, sons and daughters to those who lost their,and prosperity and good health to those of us alive. And as for the enemies of truth and God's nation Biafra, let them live, but let their mothers, fathers, sons, daughters, friends, anyone that would relate with them positively, and indeed all that give them a fraternal relationship, die every single day till the world becomes a hollow pit of pains, turture, and anguish to them, amen.